The CF-2B is the work horse of the crewed fleet, carrying kerbals into LKO and ferrying to Deep Space Craft. This latest version has a reconfigured RCS system and the addition of an experiment module to carry important scientific data and samples back to Kerbin. 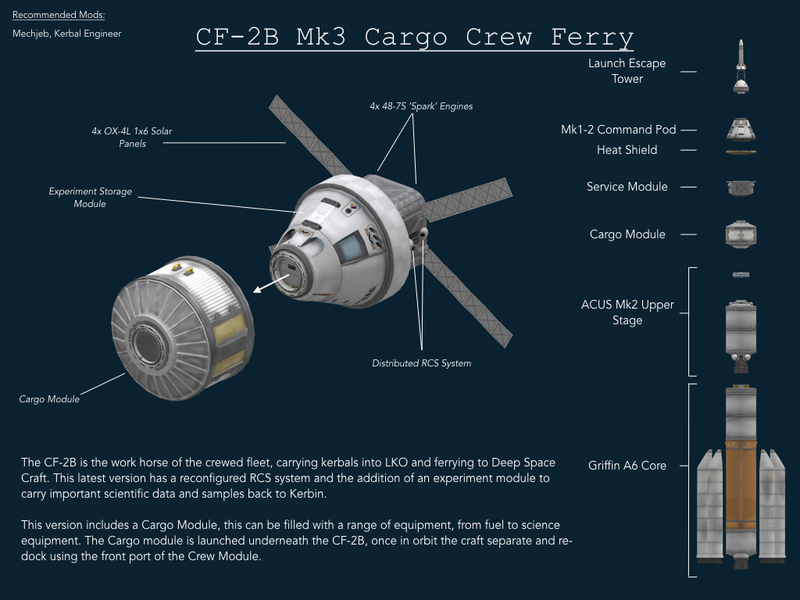 This version includes a Cargo Module, this can be filled with a range of equipment, from fuel to science equipment. The Cargo module is launched underneath the CF-2B, once in orbit the craft separate and re-dock using the front port of the Crew Module. A stock rocket called CF-2B Mk3 - Cargo. Built with 186 of the finest parts, its root part is Mark1-2Pod.